Objective To determine whether people pour different amounts into short, wide glasses than into tall, slender ones. Design College students practised pouring alcohol into a standard glass before pouring into larger glasses; bartenders poured alcohol for four mixed drinks either with no instructions or after being told to take their time. Setting University town and large city, United States. Participants 198 college students and 86 bartenders. Main outcome measures Volume of alcohol poured into short, wide and tall, slenderglasses. Results Aiming to pour a “shot” of alcohol (1.5 ounces, 44.3 ml), both students and bartenders poured more into short, wide glasses than into tall slender glasses (46.1 ml v 44.7 ml and 54.6 ml v 46.4 ml, respectively). Practice reduced the tendency to overpour, but not for short, wide glasses. Despite an average of six years of experience, bartenders poured 20.5% more into short, wide glasses than tall, slender ones; paying careful attention reduced but did not eliminate the effect. Conclusions To avoid overpouring, use tall, narrow glasses or ones on which the alcohol level is premarked. To avoid underestimating the amount of alcohol consumed, studies using self reports of standard drinks should ask about the shape of the glass. Variations in pouring and drinking behaviour mean that the amount of alcohol consumed from a mixed drink can vary widely.1–4 Although correction efforts have been suggested,5 6 an important unaccounted source of biasin self reported consumption of spirits may have to do with the shape of the glass into which a drink is poured. Suppose a person wanted to pour a target volume of alcohol, such as a 44.3 ml (1.5 ounce) “shot.” The perceptual bias caused by this interaction of vertical and horizontal dimensions could lead to unknowingly pouring more alcohol into a short, wide glass than into a tall, slender glass. Because people generally consume most (about 92%) of what they have served themselves,10 this issue of pouring accuracy is relevant to policy makers, health professionals, responsible consumers, law enforcement, and those interested in alcohol addiction and misuse. We examined whether practice in pouring or whether increased concentration can help reduce this potential bias. We recruited 198 students of legal drinking age from the University of Illinois at Urbana-Champaign (57% men) through courses in various faculties. They were given partial course credit for their involvement in the study, which had been approved by the university. 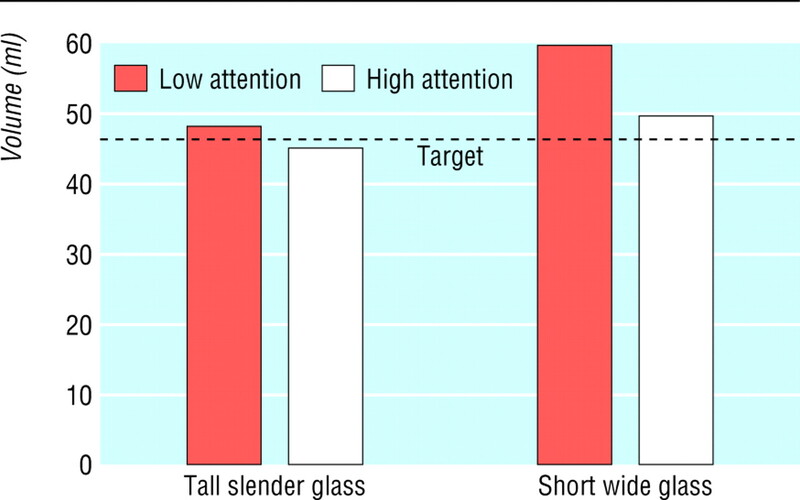 A 2×2 between subjects design manipulating shape of glass (short and wide v tall and slender) and pouring education and practice (low v high) was examined across four different drink replications. As participants arrived at the study, they were alternately assigned to one of the practice conditions. In the low pouring education and practice condition, participants conducted one practice pour into a 1.5 ounce shot glass, after which the pouring for the experiment began. Participants in the high education condition were asked to conduct 10 practice pours before beginning the pouring for the experiment. Participants were supplied with full 1500 ml rum and whiskey bottles that had been refilled with brown tea and with 1500 ml gin and vodka bottles that had been refilled with water. Half of the participants were given tall, slender 355 ml glasses and half were given short, wide 355 ml glasses. Participants were asked to pour the amount of liquor that would go into four mixed drinks that were popular at the college—vodka tonic, rum and Coke, whiskey on the rocks, and gin and tonic. They should have poured 44.3 ml (1.5 ounces) for each of the drinks. After pouring all of the drinks, participants were asked to estimate how much they thought they had poured, and the volume actually poured was measured. After a distraction task, the participants were shown the tumbler and the highball glass in a rotated order and asked to estimate the total capacity of each glass. Analysis of variance indicated that the type of drink and the interactions between the type ofdrink and the independent variables and covariates were not significant (P > 0.10) for either the actual or the perceived volumes poured. Because none of the covariates had a main effect on the amount of liquor poured (P > 0.10), the data were pooled. Of 95 Philadelphia bartenders (62% men) who were approached on a Sunday or Monday evening and offered $4.00 (£2.30, €3.40) to take part in a study on “alcohol and other consumer behaviour related issues,” 86 agreed to participate (62% men). They had an average of 6.3 years of bartending experience. A 2×2 between subjects design manipulated glass shape (short and wide v tall and slender) and the amount of attention (low v high) allocated to the pouring task. Each bartender was asked to pour the established standard amount of alcohol (44.3 ml) using 1500 ml bottles and glasses as in the study of college students. A repeated measures analysis of variance indicated that there were no main effects or interactions across the types of drinks or the order poured, so the data were pooled. Overall, the college students believed the tall, slender 355 ml glasses held significantly more than the short, wide 355 ml glasses (mean 346.7 v 329.9 ml; P < 0.05, table 1), and this visual estimation bias corresponded to an opposite bias when they were pouring. They poured 30% more into short, wide glasses than tall, slender glasses (59.1 v 45.5 ml; P < 0.01). The general tendency to pour more than a 44.3 ml shot was greatest with short, wide glasses, but participants who poured into these glasses believed they poured less than those who poured into the tall, narrow glasses (44.6 v 46.1 ml; P < 0.01). The shape of glasses continued to influence those who had done 10 practice pours only moments earlier (42.2 v 60.9 ml; P < 0.01). Although practice reduced the tendency tooverpour into tall glasses (48.9 v 42.2 ml; P < 0.05), it did not do so for the short, wide glasses (60.9 v 57.3 ml; P > 0.10). Bartenders in the high attention condition took about twice as long to pour each drink as those in the low attention condition (mean 3.7 v 1.9 seconds; P < 0.001), and they agreed more strongly with the statement that they “had paid close attention to how much they poured” (mean score 2.0 v 7.1 (maximum 9); P < 0.01). More experienced bartenders poured an average of 10.3% less alcohol than less experienced bartenders (48.2 v 53.1 ml; P < 0.05). Despite an average of 6.3 years of experience, bartenders poured 20.5% more into short, wide glasses than tall, slender glasses (55.5 v 46.1 ml; P < 0.001) (figure). The normative bias was to overpour into short, wide glasses rather than to underpour into tall, slender glasses (table 2). Bartenders who paid less attention while pouring poured more into the short, wide glasses thaninto the tall, slender glasses (59.4 v 47.9 ml; P < 0.01). If they paid careful attention while pouring, the effect was reduced (49.7 v 44.9 ml; P < 0.01)but not eliminated. This 20-30% overpouring that glass shapes can encourage needs to be accounted for in analyses of self reports of “standard” drinks. In a large epidemiological study, alcohol consumption per glass could be under-reported by as much a quarter. To account for or to correct such biases, additional questions should be added to surveys that use self reports. People drinking spirits shouldbe asked the type or shape of glasses they typically drink from (short and wide or tall and slender), and they should be asked whether they pour freehand or with the help of a measurement aid (such as a shot glass). This information can then be used to adjust reported alcohol consumption tobetter reflect the actual level of consumption. A wide range of people would like better control of alcohol consumption because of the negative consequences related to overconsumption. Those in the hospitality industry want to decrease costs (via serving size) without decreasing satisfaction. Those in public policy want to increase safety. Those dealing with alcohol counselling want to increase responsible drinking and decrease alcohol misuse. If short tumblers lead even bartenders to pour more alcohol than tall highball glasses, the way to better control alcohol consumption is to use tall glasses or to use glasses with the alcohollevel marked on them—and to realise that, when alcoholic drinks are served in a short wide glass, two drinks are actually equal to two and a half. BM and KvI both contributed to design, data collection, analysis, and writing of the paper, and are guarantors. Ethical approval Standard consent forms were signed and were sufficient for institutional approval.
. The alcohol content of self-report and “standard” drinks. Addiction 1994; 89: 593601.
. The standard drink and alcohol consumption. Drug Alcohol Rev 1992; 11: 36370.
. Measuring quantity and frequency of drinking in a general population survey: a comparison of 5 indices. J Stud Alcohol 1992; 53: 47686.
. How much alcohol is in a “standard drink”? Br J Addiction 1990; 85: 11715.
. Calculating standard drink units: international comparisons. Br JAddiction 1991; 86: 437.
. Estimating alcohol content of drinks: common errors in applying the unit system. BMJ 1989; 198: 5712.
. Bottoms up! The influence of elongation on pouring and consumption volume. J Consumer Res 2003; 30: 45563.
. The mechanisms of perception. London: Routledge & Kegan Paul, 1969.
. Vital dimensions in volume perception: can the eye fool the stomach? J Marketing Res 1999; 36: 31326.
. Super bowls: serving bowl size and food consumption. JAMA 2005; 293: 17278.
. Can package size accelerate usage volume? J Marketing 1996; 60 (3): 116.
. The effect of “standard drink” labeling on the ability of drinkers to pour a “standard drink.” Aust J Public Health 1991; 15: 5663.